You might think that we’re leaving dessert season, since Thanksgiving pies, Christmas cupcakes, and Valentine’s Day chocolates feel like a distant memory by now. A moment of silence for all of the delectable desserts that have been devoured, please. I appreciated every last slice. But hold on just a second because I’m here to tell you that your sweet tooth doesn’t need to shed any tears as we skip our way into Spring. Why? Because Spring desserts are the best desserts. A bold claim, perhaps, but it’s true. Spring desserts are all about cramming in some serious buttery, sugary, downright-decadent flavors into something magically light, airy, and bright. 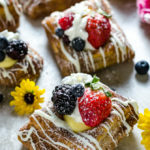 They’re about tart seasonal berries and fluffy whipped cream and pops of color like a garden that’s beginning to bloom. They’re both adorable and refined, satisfying and delicate– I mean, they really do tick every box. And I’ll tell you what; these Cinnamon Sugar Cheesecake Custard Pastries are no exception. 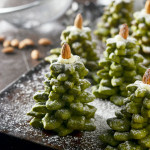 To make these pastries, I use thawed, pre-made puff pastry dough. 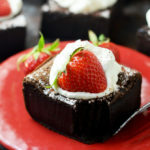 This stuff is so easy to work with but can wind up making a treat that tastes better than most from-scratch desserts. I cut the puff pastry into squares, and then use a circular cookie cutter to remove the centers of all but 6 of the squares. If you don’t have a cookie cutter, feel free to use the bottom of a glass as a guide to cut around, and that will work fine. Then I stack them up– two cut-out squares to top each intact one– and seal it all up with egg wash before popping them into the oven. (I also use the cut-out circles to make mini cups, too, because why waste when you can have more dessert?) And after about 20 minutes, just like that, I’ve got some perfectly-sized, hassle-free puff pastry pillows. …Which I then brush with melted butter. And toss in cinnamon sugar. And drizzle with melted white chocolate. And fill with creamy custard. Because when we do dessert, we do it right. Speaking of the custard, this is how you really up the fancy-factor of a dessert the easy way. I always imagined that custard would be a bit difficult to make, but as long as you keep whisking, you really can’t mess the stuff up! All you need is cream cheese, eggs, milk, sugar, cornstarch, vanilla extract, and a bit of lemon juice to create an intensely flavored, cheesecake-like custard that tastes like it came straight out of some luxurious French pastry shop. Doesn’t the yellow custard just look so perfect for Spring? Oh and did I mention that you can make it ahead of time, refrigerate it, and then just dollop it into your cinnamon sugar pastries before serving? Custard is my new dessert BFF. 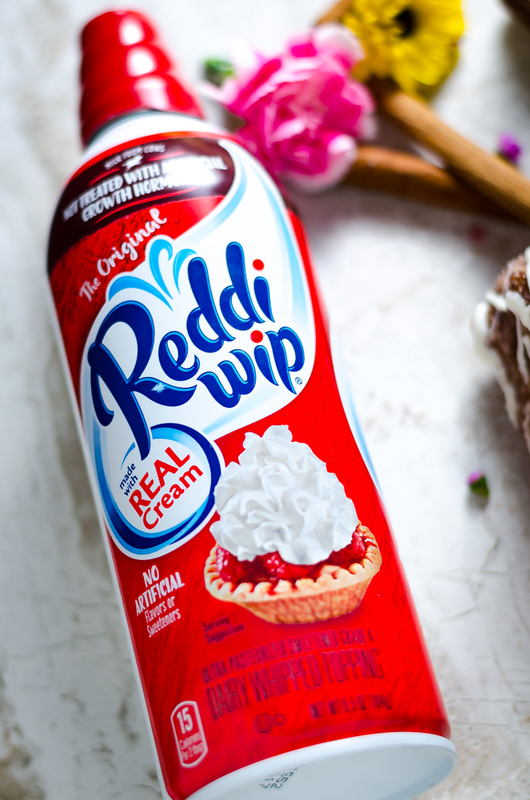 And of course no pastry would be the same without a generous mountain of Reddi-wip® on top. Just like with the custard, I keep my Reddi-wip in the fridge and spray some on top right before serving– no beating, piping or wilting to worry about. Just real whipped cream with no artificial flavors whenever I need it. I buy my Reddi-wip in the refrigerated section at Walmart (as you can tell from the photo) and I use it on everything from my coffee when I need a little pick-me-up to my ice cream to my pastries. And there are about a billion more ways to use yours up, not that you’ll have any problem running through a can! For more inspiration, check out the Reddi-wip website. 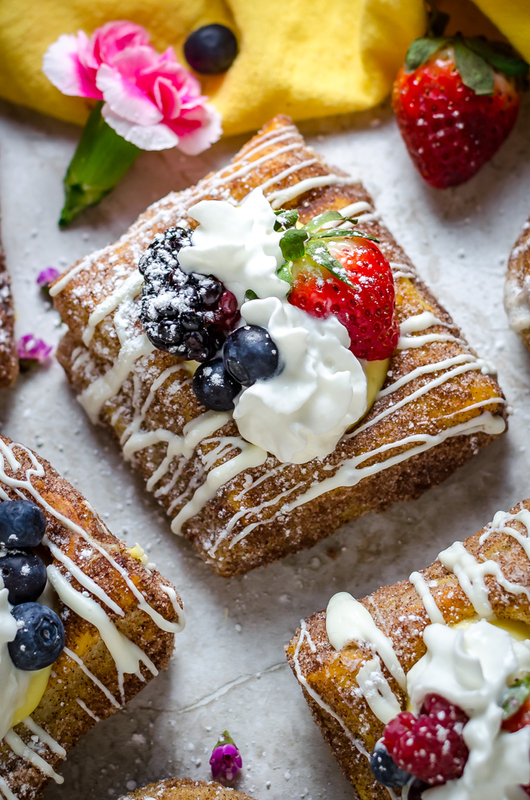 And as if the cinnamon sugar-coated, white chocolate-drizzled puff pastries with creamy cheesecake custard inside and Reddi-wip on top weren’t enough, we’ve still got more in store for these babies. After all, I did say that Spring desserts are all about color and fresh berries! 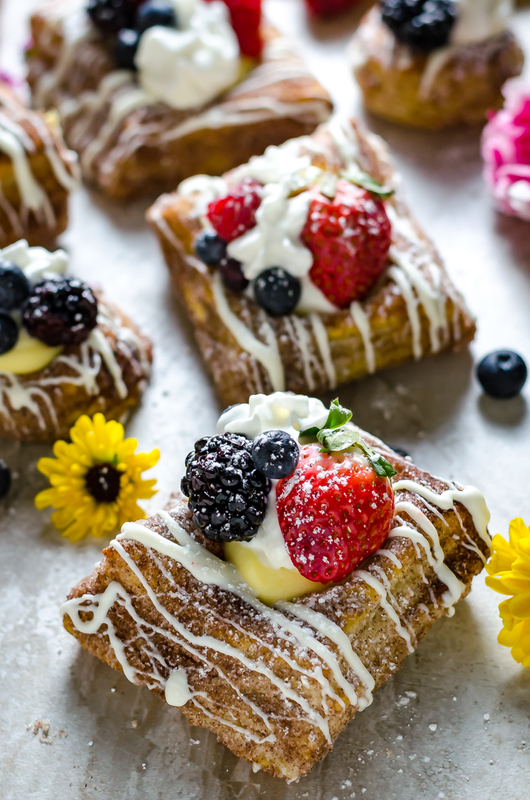 I like to top my Cinnamon Sugar Cheesecake Custard Pastries with blueberries, blackberries, raspberries, and sliced strawberries and then sprinkle them with the tiniest bit of powdered sugar before serving, just to really give them a gorgeous final touch. All together, I feel like they’re perfect for a springtime brunch, Easter get-together, or Mother’s Day celebration. 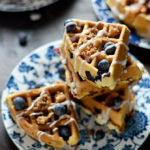 Truthfully, I think they’re even perfect for breakfast– heck, I ate a leftover one this morning with my coffee and it was glorious. Yes, glorious. I’m not even exaggerating here. 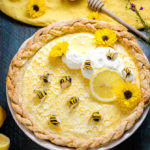 Didn’t I tell you that Spring desserts were the best? 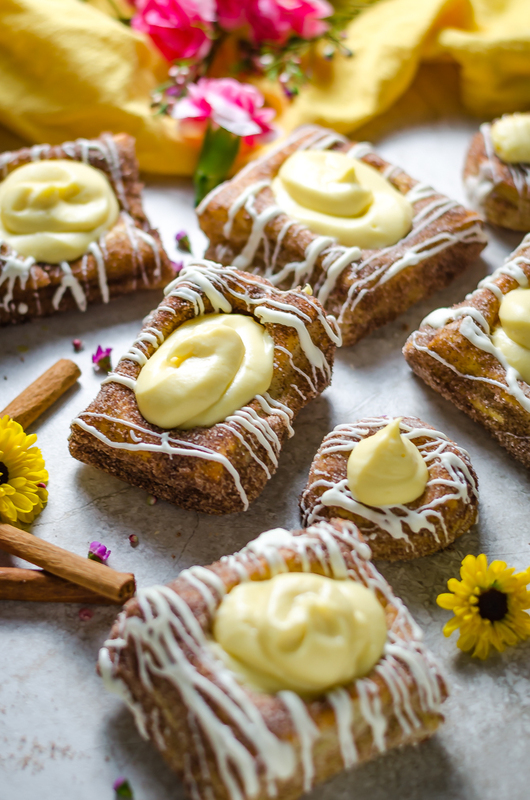 Whether you make these Cinnamon Sugar Cheesecake Custard Pastries for a holiday or just to enjoy a delicious treat in the beautiful spring weather, don’t forget to take a picture and tag #hostthetoast on Instagram to show them off. I can’t wait to see how stunning yours look! To start, make the custard. Heat 1 1/2 cups milk in a medium saucepan. Heat it over medium-heat until hot but not boiling. Remove the pot from the heat and let sit for 10 minutes. Meanwhile, beat the cream cheese, cornstarch, egg yolks, and 1/3 cup of the sugar in a large mixing bowl until creamy and well-combined. Very gradually add the hot milk to the egg mixture, beating continuously until fully combined. Pour the mixture back into the saucepan and cook over medium-low heat, whisking constantly, until the custard is thick, about 10 minutes. Remove from heat and whisk in the vanilla extract and lemon juice. Let the custard rest to room temperature, then cover the top with plastic wrap (directly on top of the custard so that it doesn’t develop a film) and refrigerate until cold and ready to serve. While the custard cools, make the puff pastry pillows. Preheat the oven to 400°F and line a baking sheet with parchment paper. Unfold one of the the thawed puff pastry dough packages (there should be two per box) and cut it into 9 squares. 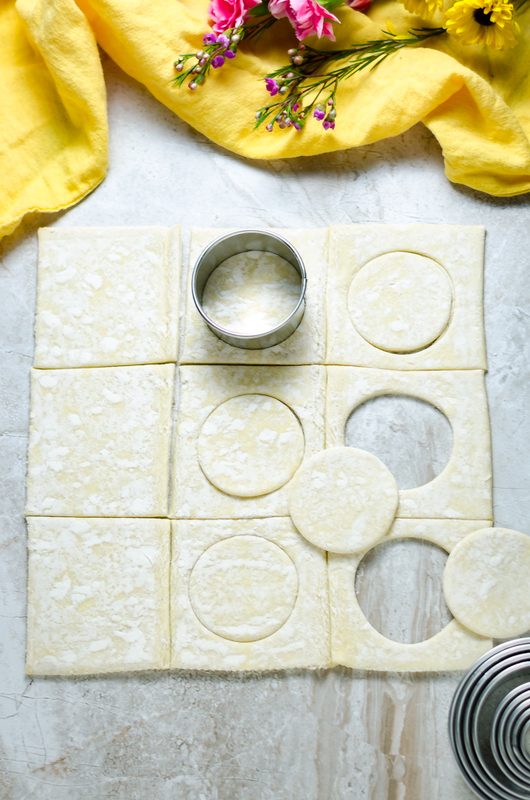 Using a circular cookie cutter, cut out the centers of 6 of the squares. Stack the squares on top of each other so that one intact square is on the bottom and two squares with holes in them are on top. This should create 3 pastry pillows. Transfer the pastry pillows to the prepared baking sheet and repeat with the remaining puff pastry dough. 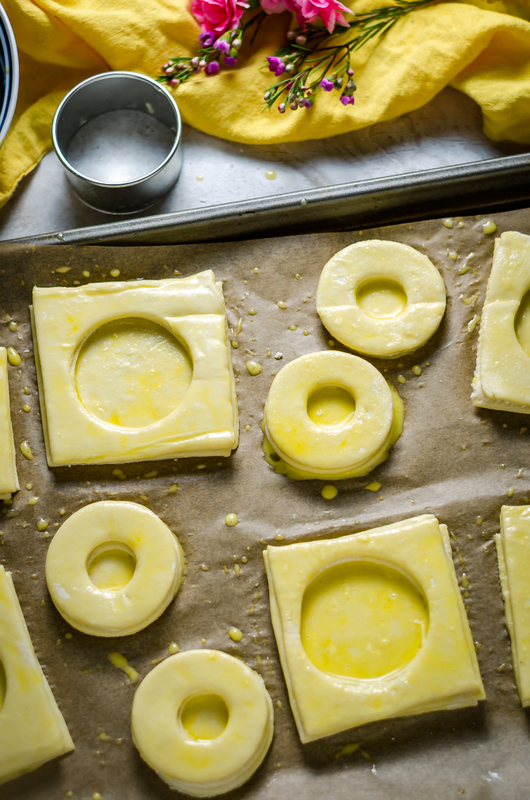 If desired, you can also cut smaller circles into the remaining dough rounds and make mini cups out of them, too. Beat the large egg with 2 tablespoons of the milk and brush all over the puff pastry pillows to seal the edges together and help them brown. Bake in the oven for 15-20 minutes, or until puffy and golden brown. In a large, sealable plastic bag, combine the remaining 1/2 cup sugar with the ground cinnamon. In a microwave-safe bowl, melt the butter. One at a time, brush the pastries with butter, place them in the plastic bag, seal, and toss the pastries with the cinnamon sugar. Repeat until all of the pastries have been coated with the cinnamon sugar. In a microwave-safe bowl, melt the white chocolate melting wafers according to package directions. 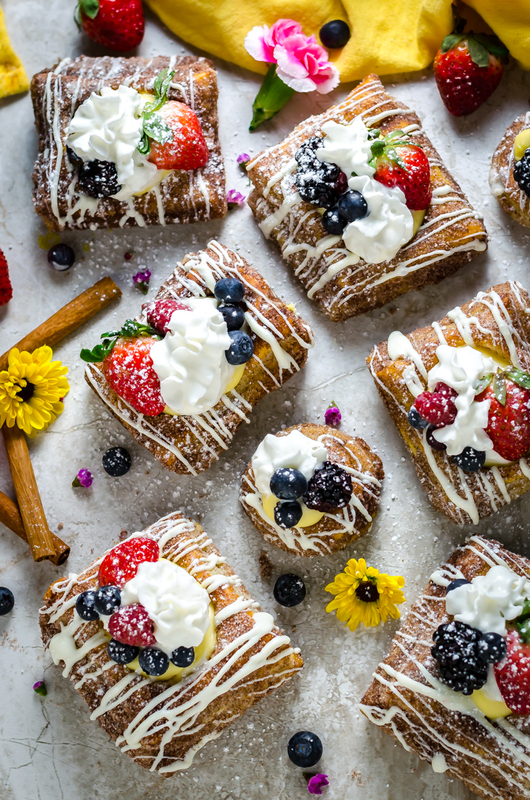 Using a fork, drizzle the white chocolate over the pastries and let set. 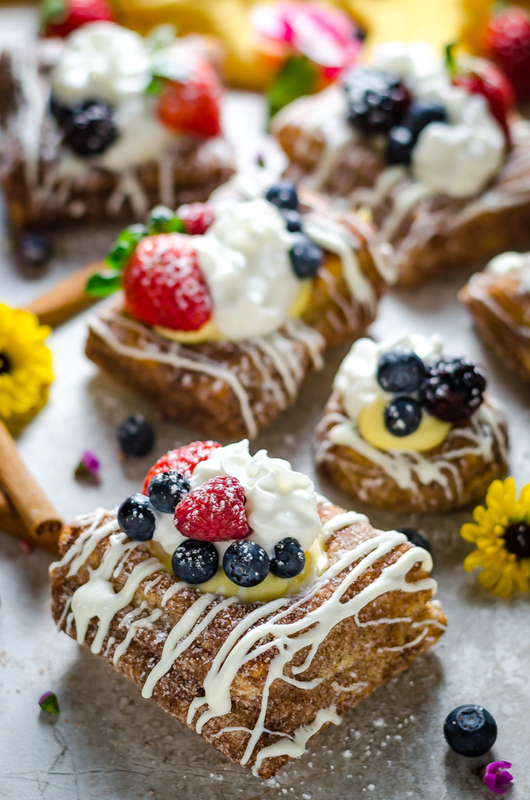 Fill the centers of the pastries with the refrigerated custard and top with Reddi-wip, fresh berries, and a light sprinkle of powdered sugar before serving.